Is it too early to review a holiday beer? I don't think so. It's starting to get cold, at least here. Like really, really cold. The other day I was out fishing and it basically started blizzarding on me. I could have used a nice Winter Warmer brew right about then. 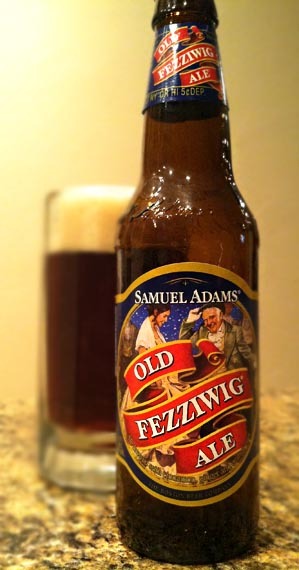 Old Fezziwig js brewed with cinnamon, ginger, and orange peel and comes in at a reasonable 5.9% ABV, although by Winter Warmer standards this is on the weak side. It pours a dark mahogany color with a thick, long-lasting lacy tan head. It has sweet and spicy aromas of toasted malts, toffee, and spice. Tasting brings a wonderfully thick, creamy mouthfeel with notes of ginger in the forefront followed by sweet toasted malts, spicy white pepper and cinnamon followed by the bitter tastes of orange pithe. I'm kind of thinking that the bitter hop flavors may have combined with the orange peel notes to create what seems (at least to my palate) to be bitter orange pithe. Honestly, this is a nice, thick, mildly warming winter beer. I would enjoy a little more spice and a little more alcohol, at least to help combat the fact that my bank account drains every Christmas. But as it is, I would very willingly drink a couple of these in a row. It's tasty, creamy, and not overly heavy. So, get out your cheesy holiday sweaters and drink up! Drink This: if you want a Winter Warmer that is tasty and creamy without being overly heavy. Don't Drink This: if you don't like spiced beers. I know some people who hated spiced beers and they should stay far, far away.